First Daughter is the first book in an ongoing political thriller series featuring Special Agent Jack McClure. The teenage daughter of the next president-elect, Alli Carson, has gone missing right before her father is scheduled to take office. Her father, Edward Carson, seeks an old friend to aid in her missing-persons case -- Special Agent Jack McClure. Carson believes McClure is fit for the job because Alli was once best friends with McClure's late daughter Emma, who died in a car accident. As McClure investigates Alli's disappearance, the current president rallies against an atheistic group he thinks is related to terrorism, also blaming them for Alli's apparent abduction. McClure, who also suffers from dyslexia, welcomes the case as a distraction from mourning his daughter Emma and stops at nothing to find and rescue Alli. First Daughter reminds me strongly of the experience I have while flipping through channels on a lazy Sunday afternoon and hearing a brief part of the ranting religious programs on public broadcasting. The religious sub-plot is annoying and really hinders any other potentially exciting plot-points. The novel is extremely ridiculous and over-the-top, with melodrama highly superseding anything important you might catch in the story-line. McClure's dyslexia is glorified and gives him the power to see his dead daughter's ghost in addition to making him awesome at being a special agent. There's nothing exciting about Alli's predictable case of Stockholm Syndrome either and finally, the focus on religious opinions is a total snore; just overall insignificant and dull...basically old news in this society of ours. 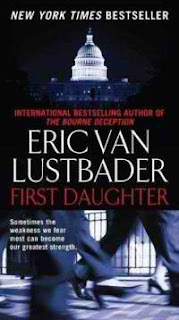 First Daughter is easily a thriller you can afford to pass up, although Lustbader has written works of far better quality; most specifically his series featuring Nicholas Linnear. The Linnear series begins with The Ninja (1980) and follows with The Miko (1984). If you just love reading political thrillers, I highly recommend checking out novels written by Phillip Margolin , who is a wildly talented storyteller. First Daughter is followed by Last Snow (2010) and Lustbader's most recent release, Blood Trust (May 2011).